NETWORK FINALS: STATION 19 lost some of its morning bounce, down 0.1 in final numbers, and LIFE IN PIECES was also down 0.1. THE BIG BANG THEORY gained 0.1. On FOX, GOTHAM and SHOWTIME AT THE APOLLO hopscotched, with the first up 0.1 and the latter down the same, but really they were extremely close with 0.55/0.53 in hundredths. CABLE HIGHLIGHTS: The night’s NBA PLAYOFFS games were split between TNT (2.01 for Boston vs. Philadelphia) and ESPN (1.24 for Cleveland vs. Toronto). MTV’s JERSEY SHORE: FAMILY VACATION dipped 0.03 to 0.87, and EX ON THE BEACH ticked up to 0.44. NBC Sports Net’s NHL PLAYOFFS games were at 0.60/0.39. On VH1, RUPAUL’S DRAG RACE gained 0.04 to 0.45, and UNTUCKED was up 0.08 to 0.39. Bravo’s SOUTHERN CHARM edged up 0.02 to 0.42, and IMPOSTERS was up 0.02 to 0.13. 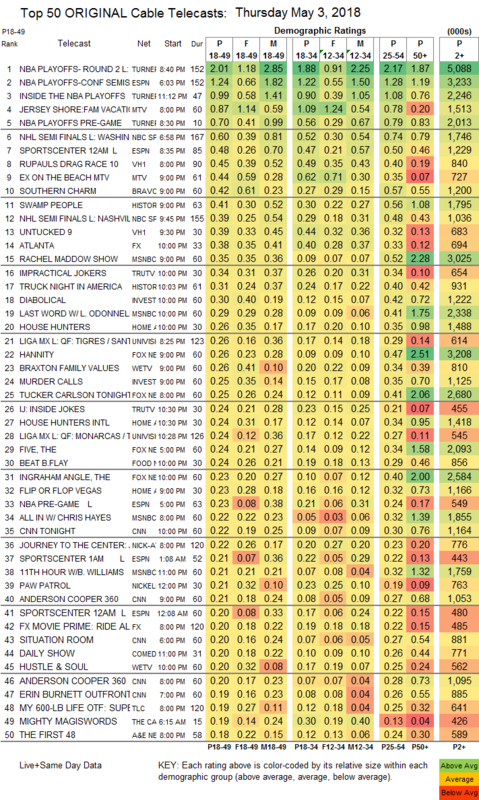 On History, SWAMP PEOPLE jumped 0.11 to 0.41, and TRUCK NIGHT IN AMERICA was up 0.02 to 0.31. FX’s ATLANTA had an impressive 0.14 leap to 0.38. MSNBC’s RACHEL MADDOW SHOW led cable news at 0.35/0.52/3M, with Fox News’s HANNITY at 0.26/0.47/3.2M, and CNN’s CNN TONIGHT at 0.18/0.27/900K. On Tru, IMPRACTICAL JOKERS rose 0.05 to 0.34, and INSIDE JOKES was up 0.07 to 0.24. On ID, DIABOLICAL grew by 0.09 to 0.30, and MURDER CALLS ticked down to 0.25. On HGTV, HOUSE HUNTERS gained 0.02 to 0.26, HOUSE HUNTERS INTL lost 0.04 to 0.24, and FLIP OR FLOP was up 0.02 to 0.23. Univision’s LIGA matches were at 0.26/0.24. On We, BRAXTON FAMILY VALUES ticked down to 0.26, and HUSTLE & SOUL was up 0.04 to 0.20. Food Network’s BEAT BOBBY FLAY shed 0.02 to 0.24. A&E’s MARCIA CLARK INVESTIGATES ticked up to 0.18. Freeform’s SIREN fell 0.07 to 0.16. 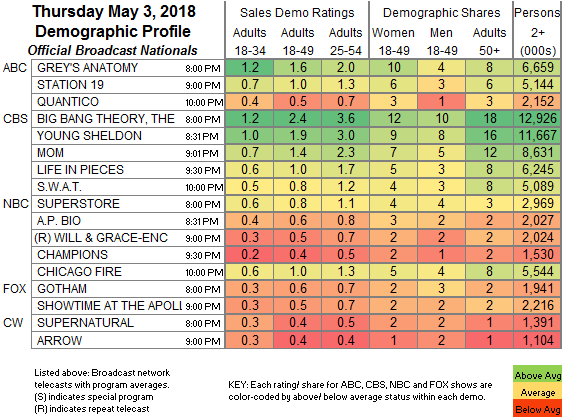 TV Land’s NOBODIES held at 0.09. POP’s IMPACT WRESTLING was steady at 0.07.